Expanding your family is exciting and a great cause of joy, but it won’t be without its ups and downs! Here are some tips to prepare your toddler (and yourself) for the new baby. It is perfectly normal for you to be worried about managing to have enough love for another child, so don’t fall into the trap of over compensating by allowing your toddler to always get his own way. If your toddler is still quite little (under the age of 4) adopt a low key attitude about the forthcoming arrival – she is still too little to understand the concept of pregnancy. A pre-school child is able to have more understanding. About three to four months before baby is due, tell her truthfully and directly about the coming birth (she will most likely be asking questions about the size of your tummy by now), but don’t go overboard with too much detail unless she asks. Assure her that having another baby will not affect how much you love her. If your toddler is in day care, or you can organise a babysitter, avoid taking her along with you when you go for your ante-natal checkups. You may have to wait for a long period of time before seeing the midwife or doctor, and it is unfair to expect your toddler to be happy and entertained in that environment. Use this time to start bonding alone with your unborn baby. Invite your toddler to help you shop for and set up the nursery, it will make her feel special and involved. 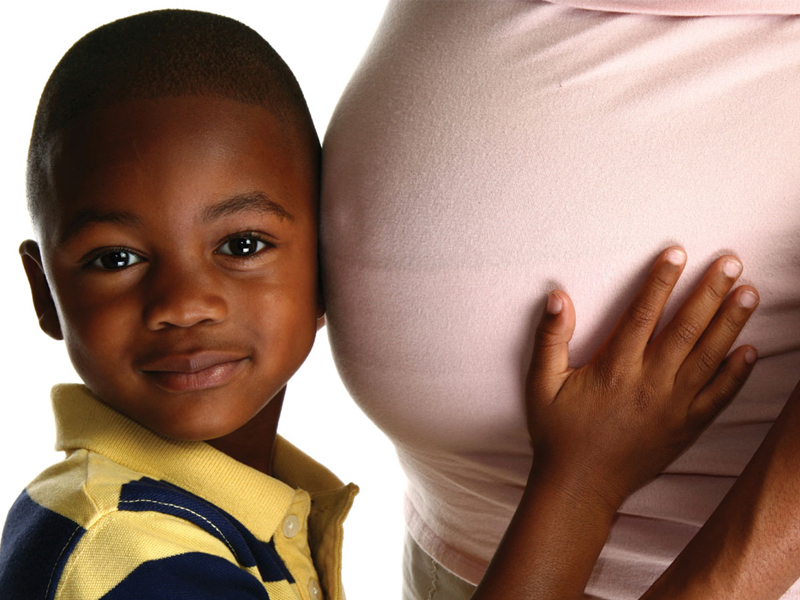 About two to three weeks before your due date, prepare your toddler for your upcoming absence. If she has never been separated from you, start to leave her with her dad or a sitter for a couple of hours a day, this way she will be used to your absence when the time comes. Dispel any fears and doubts that she may have by discussing the arrangements as clearly as possible ( “Granny is coming to look after you while Mommy is in the hospital”). If you are planning a home birth, invite your midwife to come round with her equipment and spend some time explaining to your toddler what will happen when she arrives to take care of you. Keep her away from the hospital while you are there. You may be anxious about not seeing her for a few days, but it is more traumatic for her to have to say goodbye to you after visiting hours. She may not understand why you can’t come home with her, or why she can’t stay with you. Hospitals are also breeding grounds for all sorts of horrible germs, so don’t expose your toddler to them unnecessarily. Keep her routine and structure at home unchanged. As long as she is happy and content in her home environment, and has adequate emotional support, she should take your absence in her stride. Get organised – precook meals and stock up your pantry. When you return home with the new baby, present her with a gift from her new sibling. A doll and accessories is always a good idea. • Your toddler will play up and demand your attention just when you can’t give it, so expect her demands to intensify, especially if you have just sat down to feed the baby! To the best of your ability always attend to her needs first – this will make her feel secure. Have a pile of storybooks handy and place one of her little chairs alongside your feeding chair, so that she can sit with you and read a story when you feed the baby. This is a good habit to start, and she will start to look forward to this special time. When visitors arrive to see the new baby, let her show them to the nursery, and allow her to help open the baby’s gift, this way she will feel included. Avoid saying “don’t touch the baby” too much. She will cotton on that touching the baby gets your attention and will continue to do it. If possible ignore (unless she is feeding the baby a niknak, or holding him upside down!) Never leave her alone with the new baby. Use every bit of help offered. Take the phone off the hook when you are resting, or at least invest in a portable phone to keep alongside you. Limit visitors to a specific time of the day, so that you are not inundated all day. Visitors, while having your best interests at heart can kill you with kindness! Stick to your toddlers routine scrupulously – it will make the whole family feel more secure. Expect a regression in your toddler’s behaviour. She may demand a bottle or dummy again, or start wetting her bed. Keep calm, give her what she asks for, and know that it will pass with time. Try to spend some special time alone with your toddler every day, even if it means quiet time in the garden for twenty minutes. Look after your relationship with your partner – remember that you are in this together. Top Tip: When you are still pregnant, put together a little box of age-appropriate wrapped goodies for her (for example a small box of smarties or a toy bottle), and keep this in the baby’s room. When you are busy with the baby and cannot attend to your toddler (such as when you are changing a stinky nappy, or feeding), allow her to go to her ‘special box’ and select a present. The selection and the subsequent unwrapping and exploring will buy you the time you need to finish off your task. This way, she will only associate a positive experience with the fact that you are unable to attend to her immediately. This entry was posted in 1-3 Months, Positive Parenting, Toddler Talk, Your Growing Bump & Birth. Bookmark the permalink.